Nam has earned it position as one of the top fine dining experiences in Langkawi over the years. 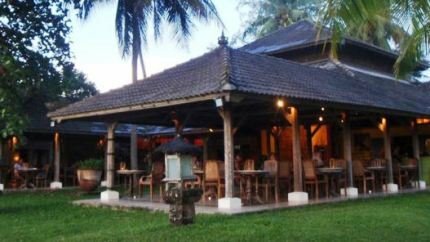 With lush garden setting, coconut & palm trees swaying and lovely view of the vast stretching paddy fields and water areas, the restaurant offers an exquisite ambience. You will feel like you are in a Malay village. If you like to watch the sunset, come a bit early, have a cocktail or a wine from the house bar and then take a vantage seating in the alfresco dining area with roof cover. The view of the setting sun over the paddy fields is awesome. Nam is located at Pantai Cenang and part of Bon Ton Resort, only about 10 minutes drive from the airport. It serves fusion dishes of eastern and western cuisine typically aimed for foreigners. But over the years it has maintained the consistency in food quality and of course worked hard on the maintenance of the property itself. Although the resort itself has only 8 villas accommodating small number of guests, the restaurant can accommodate about 80 persons. This shows how popular the restaurant is to tourists in general most of who come from outside. However after dark, there can be some problems of insects. The staff offer insect repellent sprays which would come handy. But the lights in the trees and all around in the garden make the ambience absolutely wonderful. Now coming to food... the dinner menu is more extensive than the lunch menu. All dishes are prepared using fresh local herbs & spices. In starters favorites are Thai style fish soup, barbecued lobster tails, smoked salmon with salads etc. In main courses, the first thing that comes to mind is the Nyonya platter which is a fusion of Malay and Chinese cuisine and a local specialty. It has its origin from the Spice Trade Era. Nine dishes are served on banana leaf and comprises of prawns in pandan leaf, fish prepared with tamarind flavor, beef with peanuts, chicken served on lime leaf, lamb curry with pickles, ladies finger Sambal, pineapple acar, Eggplant in coconut curry, and mango & cashewnut rice... served hot and enough in portion for one. If you are looking for western dishes, try out some of these .... fillet of snapper, seared prawns (note that lobsters in Langkawi are smaller, but tasty nevertheless), mixed grill prepared with lamb, chicken, beef and served with yellow rice, spinach etc, seafood platter (this is huge and can easily be shared by two), char grilled rack of lamb, seared fillet of beef with mashed potato etc. For vegetarians, they also have a nice vegetable platter. If you come for lunch, you can go for another house specialty (available only in lunch) - Nyonya Laksa. It combines chicken, prawn, noodles etc in a spicy coconut soup. This is a great Malay favorite. Nam also has children's menu. Between 5pm to 7pm they also serve Tapas / Mezze type snack items like smoked salmon, crispy fish, beef rendang, chicken satay, mini pizzas etc. And the dessert menu while not extensive, but has some mouth watering homemade items. Don't miss out on steamed Apple, macadamia and butterscotch pudding with gula melaka ice cream and apple & ginger Compote. If this sounds too heavy, go for a homemade ice cream like banana lime, or a cinamon & almond cheese cake with ice cream. The cocktail menu is good with many variations. While the wine selections are short but quite good. The service is friendly and quite prompt. If available, the staff would offer you choice of tables. NOTE: There are cats everywhere and don't be surprised if you see one sitting on a chair next to you. If you do not like cats, then this is one point to consider before deciding on Nam. This is an upscale fine dining restaurant and food is expensive. Starters: RM 26 - 42. Main Courses: RM 48 - 74. Desserts: RM 10 - 38. Lunch is served 12noon to 5pm. Dinner from 7pm to 11pm (daily). Bon Ton Restaurant & Resort, Pantai Cenang, Langkawi (entry from Jalan Pantai Cenang road).